Note this is an old article I wrote sometime ago in 1999 but rather than discard it I've included it in the tutorials section as there's some good reference links. Recently I've been working on producing cloud, smoke & dust effects in 3DS Max 2.5 using plug-ins including Afterburn and Pyrocluster. Looking at clouds frequently & thinking about ways to produce them has led me to write my thoughts down, mainly to pass on my wishes to the plug-in developers & to open a discussion about ways of rendering clouds in 3DS Max. So far this article just concentrates on clouds, there are many more wishes for smoke & fire effects. Creation & Animation of Cloud volumes. Use a bitmap or gradient (similar to Matterwaves) either to generate the particles or control the cloud volume directly. Pros: more intuitive, should be much faster to work with, also ties in with Matterwaves. Cons: Could be slow to change, how to translate from 2D into a 3D volume. Have a new particle system type that would be able to create clouds of particles that had the characteristics/structure of real clouds, the way they flow & stream together. I think a combination of methods would work, a manual vertex/particle system adjustment/creation but only after setup using bitmaps first. Using them to have a bitmap/gradient 'quick start', you could then either scale up with the mouse a flat cloud (must be able to change scale axis position i.e. grow a symmetrical or hemisphere type cloud) or use the greyscale value of the image to pass onto the height of the cloud (darker the image the higher the value), another side view bitmap/gradient could be blended with the top view & used to create a 3D volume. These or other bitmaps/gradients should also be able to control the creation of the size of the cloud shapes. Once the vertex/particle clouds are created in some cases you would need/want to be able to edit the particle cloud, similar to a edit mesh, employing soft selections methods & perhaps some way of painting rotation within the particles as well? Probably an even more basic method of single particle/cloud shape creation would be used as well, holding the left mouse button down left & right movement could control height & width with up & down perhaps controlling rotation, a good/quick interface would be need for this method. There needs to be a much more varied fractal cloud material types, I've listed at the bottom of the page the actual cloud types that occur in real life. Now I don't think we need to use all of them, perhaps only 4 to 6 new types. Identifying the most different types that are wanted by the users & feasibility by the programmers is needed . For example, long thin wispy types of cloud are just not possible to do at the moment & I'd like ways of being able to do them. The fractal controls in Pyrocluster appear to be limited to the single volumes that each of the particles create. This causes the 'cotton wool ball' effect where the look & motion of the clouds is just not believable. Would perhaps a metaparticle system of some kind in which the shape/volume of many particles became (where appropriate) a single volume instead be more appropriate? Another more intuitive way which I'd like to use would be able to blend with bitmaps/gradients different layers of fractal cloud types to form a new type. An example below using Pyrocluster, 2 fractal cloud types A & B, are blended with a simple greyscale gradient in two different ways, one where just the fractal clouds types are blended to create a new cloud type & another where the separate colour/shadow parameters have been changed & blended to create a very different looking cloud. Being able to blend, mix & match between fractal cloud types I think would give the user a very powerful tool to create almost anything they want. Other blending I'd like to see would be to lighting and shadow density/quality, you could also have a boolean type blending between layers as well, to avoid a very complicated interface you should be able to 'flatten' these to a separate fractal layer this way you could build your own cloud types & save them with a preview bitmap (beta testers could help provide a starting set perhaps?). Another options I'd like is one for sharpness of fractal type using direction of pickable lights, some clouds like this one seem to be much sharper/crisper from the direction of the light source. Also I'd like to see a level of detail/variable quality setting of the world step size based on either depth to camera (environment ranges), speed to camera (motion blur) or a user setting perhaps using a gradient/bitmap using either camera mapping or UVW on the particle system. This would speed up rendering and give the user control of where the quality was needed. Relatively large cumulonimbus producing most of the damage associated with severe thunderstorms. It can produce large hail, flash floods, severe wind gusts, wall clouds and tornadoes and has a relatively long life span. Common features include an overshooting bulge through the top of the storm and a long life cycle - typically 2 hours or more. Is also called a mesocyclone if rotation is occurring within the thunderstorm cell. Cumulonimbus with an anvil typically known as a thunderstorm. Also known as Cumulonimbus Capillatus. Cumulonimbus or large cumulus with basically no anvil although the tops may become striated. 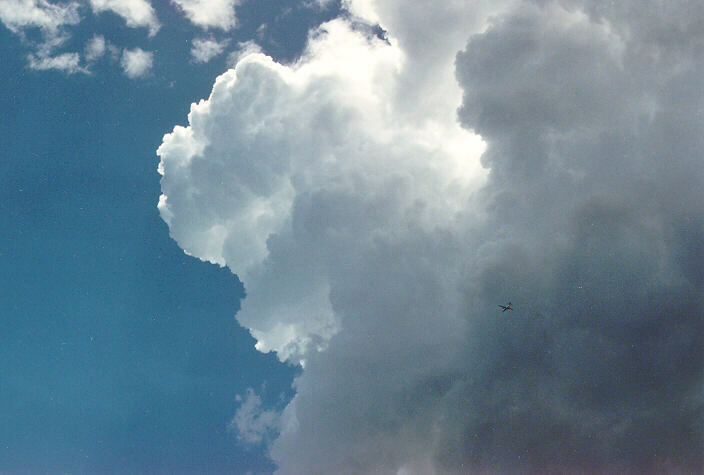 Cumulus clouds which are markedly sprouting and are often of great vertical extent with tops resembling a cauliflower. Their heights exceed the dimensions of their bases. Cumulus clouds of moderate vertical extent, the tops of which show fairly small protuberances. The base is a similar in width to the cloud height. Cumulus clouds of only a slight vertical extent. They generally appear flattened. Their bases are much wider than the their heights. Forms in layers sometimes hundreds of kilometres across. It usually has a ragged upper surface while the base is relatively flat. The most common cloud type. Stratus clouds form in sheets or layers in the lower parts of the atmosphere. Fog is classified as stratus. Cumulus in the middle levels of the atmosphere associated with the lifting of a large air mass and instability. This cloud is found in the middle levels of the atmosphere and is always a sign of the presence of significant amounts of moisture in those layers. It is typically featureless, ranging from a thin, white veil of cloud through which the sun is clearly visible, to a dense grey mantle that may block out the sun completely. Rain producing cloud which varies in thickness and layers mostly occurring in a widespread sheet. High level clouds that appear as small rounded puffs arranged in rows or sheets. Ice crystal clouds that appear in the form of extensive sheets that may cover the whole sky. Cloud definitions & links from Australian Weather Photography web page, please note their Copyright notice. The material on this page is copyright Kieron Helsdon 1999. You have the right to view this page but you are not granted any other rights and the copyright owner reserves all other rights.